No anthem? 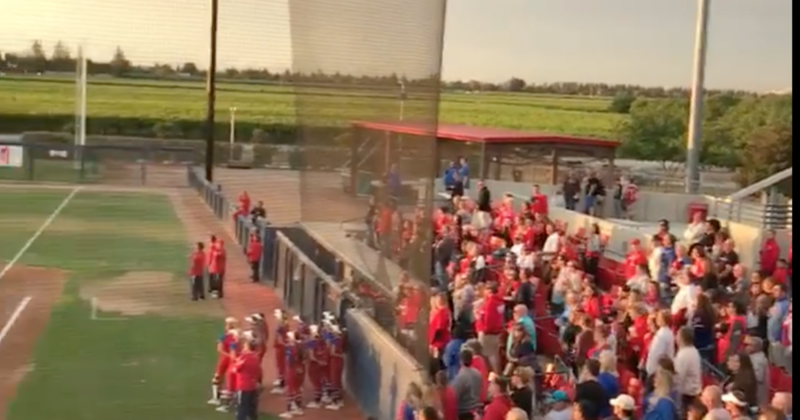 It was not a problem for an audience in Fresno, California, to boo and then sing the "Star Spangled Banner" at a high school softball championship game after an announcer said the anthem would not be sung. The video of the patriotic act made the rounds in the social media days before Memorial Day. Hundreds of fans who attended a game between Clovis High and Buchanan on Friday at Margie Wright Diamond of Fresno State University were incredulous when they learned that the song was not being played. Nevertheless, they sang a cappella. Tiffany Marquez, a fan who attended the game, took video of the improvised choir. We came to the CIF D1 section championship game between Clovis and Buchanan and the announcer said "there will not be a national anthem." After a bit of booing, the whole stadium got up and began to sing it for themselves. "Honestly, I was shocked (as) the spokesman said," There will not be a hymn, let's just play softball, "Marquez said Fresno Bee. "Within seconds, people in the crowd could be heard singing and raising the volume of their voices. There I stood in the midst of a true testimony of unity and patriotism. " Event Coordinator Bob Kayajania took responsibility for deciding not to play the anthem.
" The national protocol is the first game of the session in which you have the national anthem, "Kayajania told the bee." The game after that is just played. We were caught. They started to play some music and people took that as a national anthem and they all started singing, which in my opinion is a wonderful thing to show their patriotism. " Kayajania called it a "learning experience" and going forward, the anthem is played at every game. As far as the softball game, Clovis defeated High Buchanan 6-3 to win the Central Section Division I championship. The national anthem also made headlines this week as the NFL announced a new policy that players must stand on the field for the song, otherwise the team will face a penalty n also the possibility to spend the night in changing rooms.